YEARENDER: Wall Streeters throughout 2011 became starry eyed when they talked about tech stocks. But they still had a soft spot in their hearts for traditional media companies all year long. Five of the seven companies in the Big Media group beat the Dow Jones Industrial Average’s 6.1% increase (through December 29th) — four of them by a lot. And they weren't outliers: The Standard & Poor’s broadcasting index was +15.2% while the S&P movies and entertainment index was +10.2%. Many of the stocks were bolstered by the industry-wide improvement in ad sales. In addition, there was a general sense of relief — perhaps a pipe dream — that digital companies don’t yet pose a clear and present danger to the way traditional movie and TV companies do business. We’ll see how long that lasts. Here’s how each of the Big Media companies fared in 2011, in order of how well the stock performed. Next to the company name is the percentage increase or decrease in the stock price this year as well as the price-earnings ratio (the stock price divided by the expected earnings per share) which is a rough measure to compare how cheap or expensive the stock is compared to its industry peers. Viacom (Stock: +13.8%, PE: 12.7) Viacom’s shares probably would have closed the year much higher if it weren't for the startling, and still perplexing, recent decline in Nickelodeon’s ratings. The drop in its live plus same-day audience accelerated from -5.4% in 3Q to -15.7% in October and -18.1% in November. CEO Philippe Dauman called the Nick situation a “blip,” touted the channel’s new programming plans, and questioned Nielsen's measurements. He also announced in November an eye-popping increase in Viacom's share repurchase authorization to $10B from $4B. Investors still want proof that Nick and other Viacom networks aren't running out of gas. That said, they liked a lot of other things that they heard from the company in 2011 including its strong upfront ad sales and new digital syndication deals. Movie service Epix became profitable. Paramount also had a great year at the box office with releases including Transformers: Dark Side Of The Moon, Thor, and Captain America: The First Avenger. Viacom probably will have to settle for less in 2012 as the Marvel titles shift to Disney. EPS (FY ended in September) $3.78, +25.2%. You can read the full article here on the official Deadline.com website. YEARENDER: We’ll probably remember 2011 as a lost year for Big Media. Tech companies continued their drive to harness the Web in ways that could topple existing infotainment businesses. But most traditional media execs just smiled and said that their industry has nothing to fear but fear itself. You’ll go blind looking for major new initiatives, with one exception: Dish Network’s Charlie Ergen bought airwave spectrum and took Blockbuster out of bankruptcy as part of a plan to create a national video streaming service. Other companies didn’t even try to cut transformative deals although Comcast had its hands full trying to fix NBCUniversal, which the cable giant formally took over in January. Meanwhile the giants are grappling with unique concerns. For example: CBS may find it has nowhere to go but down following its recent success in ratings and ad sales. Comcast has the opposite problem at NBC; hits have eluded the network as its ratings continued to fall. Disney’s also struggling to boost ABC’s audience while its cash cow, ESPN, could face growing competition – including from Comcast, which hopes to turn its cable channel Versus into a sports power after January when it will be renamed NBC Sports Network. News Corp has to fend off investors calling for the company to ditch its declining newspapers, which include The Wall Street Journal. Time Warner has to prove that it can develop a film franchise strong enough to replace Harry Potter. And Viacom faces new questions about whether Nickelodeon can recover from its declining ratings, and Paramount can repeat this year’s strong performance at the box office with fewer releases to distribute from DreamWorks Animation and Marvel. Nickelodeon USA Gives Viewers A First Look Sneak Peek At Nickelodeon's Brand New Comedy Show "How to Rock"
To celebrate "2012 On Nickelodeon", Nickelodeon's big plans for the new year, and Nickelodeon USA premiering Nickelodeon's latest brand new live-action comedy series "How to Rock" on Saturday February 4, 2012, Nickelodeon USA recently aired a exclusive "First Look At How to Rock" sneak peek special (streaming video below) which Nickelodeon North America aired as part of Nick USA's "The Best Week On TV" programming stunt, in which Nickelodeon unveiled to Nickelodeon viewers Nickelodeon's brand new sitcom "How to Rock", which included behind the scenes of "How to Rock" footage (including shots of a famous Nickelodeon Directors Chair, Nickelodeon Star Cymphonique Miller getting welcomed onto the "How To Rock" set on the Nickelodeon soundstage, and a famous Nickelodeon Green Room), how the cast of "How to Rock" are good friends on-screen and off-screen, that "How to Rock" will introduce "totally new music" and "hilarious characters", and an exclusive interview with Nickelodeon star and "How to Rock" lead actress Cymphonique Miller, who plays the lead character 'Kacey Simon' on Nickelodeon's "How to Rock", who talks about how funny her "How To Rock" co-stars Noah Crawford (Nelson) and Chris O'Neal (Kevin) are, the casts 'energy ritual', and what it's like to film and shoot "How to Rock" in front of a live studio audience. What rocks about the new show How to Rock? Find out, when the cast dishes about the show behind-the-scenes! And don't miss the new series, How to Rock - This February! Watch a Sneak Peek of the New Live-Action Series on Nickelodeon:How To Rock with Cymphonique Miller and the Cast. Premieres February 4th on Nickelodeon! Nickelodeon UK has yet to announce the premiere date for when Nickelodeon UK and Ireland, Nickelodeon HD UK, and Nick Replay UK will start to air the brand new Nickelodeon show "How To Rock". Kung Fu Panda: Legends of Awesomeness tells the continuing adventures of Po the Panda as he takes on many new responsibilities and face brand-new adversaries in his continuing education as the Dragon Warrior ... for being the Dragon Warrior is not a destination, it’s a journey (unfortunately for Po, that journey is uphill). In Best Player, Quincy is a thirty-something baggage handler by day and online video game master by night. Perfectly happy to live in a tricked-out basement in his parents' home, Quincy has dedicated his life to sell their house and move to Florida. His only chance to maintain his "perfect" life is to enter a tournament introducing a brand-new video game - Black Hole - and win the prize money to buy his parents' house. As the current multi-player champion, Quincy thinks it’s a done deal.. until he encounters "Prodigy", who threatens to annihilate him. Bikini Bottom is buzzing with excitement as the town prepares for a sleigh race sponsored by an anonymous donor. But the gang’s dreams of winning the $1 million prize come to a screeching halt when they discover Plankton’s scheme to steal the Krabby Patty formula during the race. Spongebob and his friends must work together to navigate through the icy tundra and past a menacing snow mollusk before Plankton gets his hands on Mr Krab's secret formula. This is the adventure of Grachi, an adolescent who will discover her incredible magical powers, all while coping with school, boys and growing up, which will cause her many tangles... but none as the tangle when she discovers, for the first time, love... and understands that it is the true power. Her rivalry with classmate Matilda for the affection of heart-throb Daniel sets the stage for a bewitching battle of spells that is sure to captivate viewers worldwide. It's Dora's birthday and you know what that means .. A fun filled party with all her friends. The only problem is Dora and Boots are stuck in storybook land! Do you know who Kai-lan’s favorite superhero is? The Monkey King! He has amazing magical powers, and he can transform into all kinds of things. Today, Kai-lan, Rintoo, Tolee and Hoho are having a Monkey King PARTY at their playhouse. After the Trix steal Bloom’s Dragon Power, the Winx set out to stop them from destroying the Magic Dimension. Daphne tells Bloom that in order to defeat the Trix, she must believe in herself and find her own Dragon Power within. Sophomore year begins at Alfea College, but with an orientation party! To celebrate the release of the third and final wave of Johnny Cupcakes's "A Johnny Cupcakes Nickelodeon Collaboration" Nickelodeon clothing and accessories line, which feature characters from classic Nickelodeon animated shows from the 1990's, worldwide on Saturday 31st December 2011, Johnny Cupcakes have released this high quality high-definition exclusive video which charts and details the creative processes that made Nickelodeon's retro "A Johnny Cupcakes Nickelodeon Collaboration" clothing and accessories line possible, from the beginning to the actual 'episode' releases, and features interviews with Nickelodeon USA staff members and executives Rob LaQuinta (Creative Director of Product Design & Development at Nickelodeon), Thad Baltimore (Associate Art Director at Nickelodeon / MTV) and Suzy Lee Raia (Vice President (VP) Licensing and Apparel at Nickelodeon) who talk about what it was like to have the rare chance to work with Nickelodeon's classic properties from 10-20 years ago which were the "life force" of Nickelodeon, such as "Rugrats", "The Ren & Stimpy Show", "Rocko's Modern Life", "Aaahh!!! Real Monsters", "CatDog", and "Hey Arnold!" for Nickelodeon's 1990's programming block ("The '90s Are All That" on Nickelodeon's TeenNick channel), how all of Johnny Cupcakes's stores/shops are like bakery's and them being about insider knowledge, and how Nickelodeon wondered what the Nickelodeon brand would look using Johnny Cupcakes's famous design. Johnny Cupcakes x Nickelodeon | Conception to Completion from Johnny Cupcakes on Vimeo. 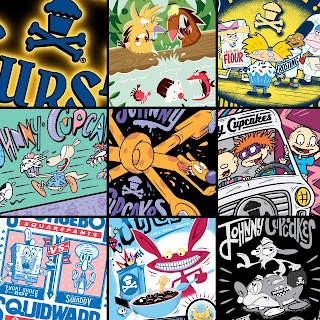 The third and final installment of the Johnny Cupcakes x Nickelodeon collaboration is here and this video details the project from its conception to its completion and execution. The third batch (also known as "Nickelodeon Episode 3") of Johnny Cupcakes' and Nickelodeon's "Johnny Cupcakes Nickelodeon Collaboration" clothing and accessories line, also known as "JCxNick", will be released worldwide at all of Johnny Cupcakes's stores and online on the official Johnny Cupcakes website, JohnnyCupcakes.com, on Saturday 31st December 2011. 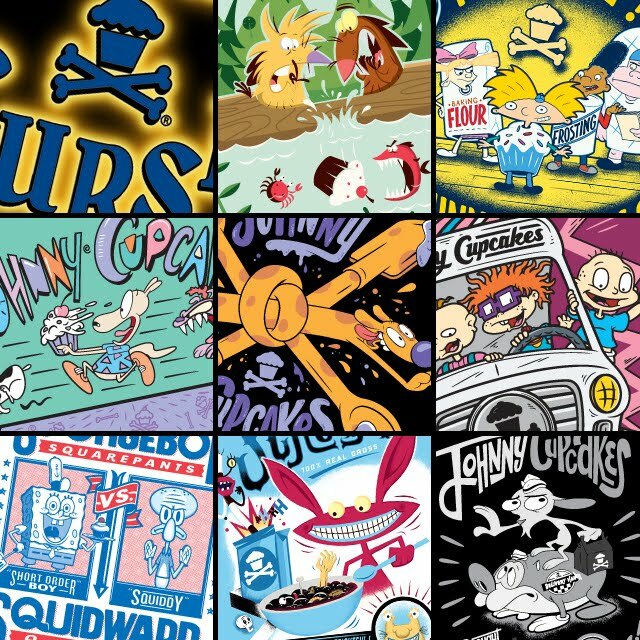 The third and final installment of the Johnny Cupcakes x Nickelodeon collaboration is upon us and the video seen above details the project from its conception to its completion and execution. What was once a dream of mine—working with Nickelodeon turned into a goal, a working progress—& now a trophy of positive memories. This entire collaboration would not have been possible without the Johnny Cupcakes team, the Nickelodeon team, and all of you for continuing to support this brand. Without you, we wouldn't be able to keep successfully creating these fun projects and unique experiences. We owe a great deal of gratitude to the folks over at Nickelodeon that made this all possible. 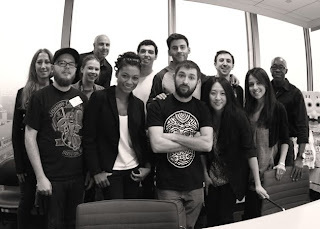 Their guidance and support was invaluable throughout this entire project. The Johnny Cupcakes family did a fine job of executing everything from promotion to order fulfillment. I’d like to especially thank Lucas Dunn for keeping this project well planned and organized on the daily; our creative superhero Chris DeLorenzo for elevating this collaboration far beyond our midnight society campfire chats of trying to decide which cartoons to work with—to bringing these characters to life; and most of all, my loving parents for getting cable and allowing me to build forts in their living room. This lead to eating pounds of Dunkaroos while watching (and falling in love with) Nickelodeon. Thanks for the best childhood and adulthood ever—love you mom and dad! We can all take a step back now and smile at what we were able to achieve with this once-in-a-lifetime opportunity. Nickelodeon USA Gives Viewers A First Look Sneak Peek At "2012 On Nickelodeon" - Brand New Episodes And The Premiere Of "How to Rock"
Below is a streaming video of Nickelodeon USA's brand new "January And February 2012 On Nickelodeon" sneak peek promo/trailer which Nickelodeon USA is airing to promote Nickelodeon's schedule plans and highlights for "January And February 2012 On Nickelodeon", including Nickelodeon USA premiering more brand new episodes from season five of the hit Nickelodeon show "iCarly", Nickelodeon USA premiering brand new episodes from season three of the popular Nickelodeon series "Victorious", brand new season two episodes of Nickelodeon's hit live-action mystery "House of Anubis" (starting on Nick USA Monday January 9 2012 at 7:00 p.m. (ET/PT)), and the premiere of Nickelodeon's latest brand new live-action series "How to Rock" (premieres on Nick USA Saturday February 4, 2012). Coming in 2012, Nickelodeon's got big plans for the New Year and Nickelodeon promises you Brand New Fun, New Friends that will crack you up, New Laughs you'll never forget, and New Surprises that will keep you guessing as part of "2012 On Nickelodeon"! Below is a streaming video of Nickelodeon USA's great brand new "First Look At Season Five Of iCarly In 2012" sneak peek special which Nickelodeon USA recently aired as part of Nick USA's "The Best Week On TV" programming stunt, in which Nickelodeon unveils to Nickelodeon viewers and fans of the hit Nickelodeon show "iCarly" what to expect in the brand new episodes of "iCarly" season five that Nickelodeon North America will premier in 2012, including the very first episode of iCarly to be filmed and shot in 3D ("iCarly 3D"), Freddie Benson getting tired of hiding behind the scenes and getting to go in front of the "iCarly" camera and host "iCarly" for the very first time in the brand new episode of "iCarly" called "iBalls", Sam Puckett's very first trip and visit to the "Fat Cake" factory and World Headquarters in the brand new episode of "iCarly" called "iToe Fat Cakes", and the biggest "iCarly" first of all - the First Lady of America, Michelle Obama, guest stars and joins the "iCarly" cast in a very special episode of "iCarly" called "iMeet the First Lady"! Click on the play button below to watch Nickelodeon USA's exclusive first look preview of what's new and coming up in Nickelodeon's brand new episodes of "iCarly" in 2012 which are packed fill of firsts! Who is enjoying the new episodes of Olive the Ostrich? Which one has been your favourite so far? Brand new episodes, weekdays on #NickJrUK. Watch new episodes of #Olivetheostrich all ths week at 8.15am, 4pm & 6.30pm on @NickJrUK. Translation of the Nickelodeon Press Release by Google Translate - In 2012 there are already lots of new series in the pipeline. So in the spring brings Nickelodeon series "Life with Boys", a live action series from the creators of Hannah Montana. In the fall are "Legends of Korra", a spinoff of the hit series Avatar, and "Teenage Mutant Ninja Turtles", a remake of the same name and original animation series from 1988, on the program. Original - Ook in 2012 staan er al een heleboel nieuwe reeksen op stapel. Zo brengt Nickelodeon in het voorjaar de reeks “Life with Boys”, een live action serie van de makers van Hanna Montana. In het najaar staan “Legends of Korra”, een spin-off van de succesreeks Avatar, en “Teenage Mutant Ninja Turtles”, een remake van de gelijknamige en oorspronkelijke animatiereeks uit 1988, op het programma. "The Last Airbender: Legend of Korra" will focus on Korra, a teenage female from the Southern Water Tribe and the current incarnation of the Avatar, who is "hotheaded, independent, and ready to take on the world". The series plans to follow Korra as she learns Airbending, having mastered the three other elements (Water, Earth, and Fire), while facing an anti-bender revolution. Korra will have to learn Airbending from master Tenzin, son and youngest child of Aang and Katara. Korra will also have an Animal Guide who is a Polar Bear Dog called Naga. "The Last Airbender: Legend of Korra" will also be set at least seventy years after the defeat of Phoenix King Ozai and Princess Azula in the original "Avatar: The Last Airbender" series. You can watch Nickelodeon's official trailer for the upcoming series "The Last Airbender: Legend of Korra" here on NickALive! Nickelodeon USA (Nickelodeon North America) is expected to premiere "The Last Airbender: Legend of Korra" in mid-2012. Nickelodeon UK has still to announce plans to premiere and show "The Last Airbender: Legend of Korra". Translation by Google Translate - In 2012 there are already lots of new series in the pipeline. So in the spring brings Nickelodeon series "Life with Boys", a live action series from the creators of Hannah Montana. In the fall are "Legends of Korra", a spinoff of the hit series Avatar, and "Teenage Mutant Ninja Turtles", a remake of the same name and original animation series from 1988, on the program. According to the official Nickelodeon UK websites schedule section for Nickelodeon UK and Ireland's and Nickelodeon UK HD's schedule for Monday 16th January 2012, Nickelodeon UK will start to premiere and show episodes from season 3 (series 3) of the animated series "Winx Club" on Nickelodeon UK and Ireland and Nickelodeon HD UK every weekday at 3.30pm (4.30pm on Nick Replay UK) from Monday 16th January 2012. 3:30pm Winx Club When the universe is in danger from evil witches, only five magical girls can save us all! Bloom, Stella, Flora, Musa and Tecna are The Winx Club, saving the world while they're still in school! Series 3 of everyone's favourite fairies. Winx Club, is an animated modern fantasy adventure series that follows six best friends - Bloom, Stella, Flora, Musa, Tecna and Aisha - enrolled in Alfea College, the finest fairy school in all the realms. When trouble arises, the Winx transform into beautiful fairies who use their unique magical powers to fight villains and save the world from evil. You've seen the magic in the Winx Club specials! Now seen the Winx like you've never seen them before! New Winx Club series, starts the 16th of January, on Nickelodeon! Nickelodeon UK previously showed the original version of the animated television series "Winx Club" in the mid-2000s. Gingka is back, and this time, he's taking on the world! Beyblade: Metal Masters, starts the 9th of January, on NickToons. UPDATE - Nickelodeon UK and Ireland have announced and confirmed on their official Twitter profile page (@NickelodeonUK) that Nickelodeon UK and Ireland and Nickelodeon HD UK will be premiering and showing two brand new episodes of the hit Nickelodeon sitcom "Victorious" In February 2012. According to the official Nickelodeon UK websites schedule section for Nickelodeon UK and Ireland's and Nickelodeon UK HD's schedule for Thursday 24th February 2012, Nickelodeon UK and Ireland and Nickelodeon HD UK will premiere two brand new episodes of the popular Nickelodeon show "Victorious" (or the UK premiere of the "Victorious" special episode "Locked Up!") on Thursday 24th February 2012 at 6.00pm and 6.30pm (7.00pm and 7.30pm on Nick Replay UK). Time and date subject to change. when is there new victorious? icarly? and HOUSE OF ANUBIS?! please reply! @NickelodeonUKPR - new eps of iCarly and Victorious coming up in February so keep your eyes peeled for more info! According to the official Nickelodeon UK and Ireland and Nickelodeon HD UK websites schedule section for Nickelodeon UK's schedule for Saturday 3rd March 2012, Nickelodeon UK and Ireland and Nickelodeon HD UK will premiere the brand new episode of the popular Nickelodeon show "Big Time Rush" called "Big Time Wedding", where James' fairy tale romance with a princess becomes an escape mission after he inadvertently proposes marriage, and the Big Time Rush guys have to free him before he's forced into a royal wedding, on Saturday 3rd March 2012 at 5.30pm (6.30pm on Nick Replay UK). Time and date subject to change. According to NickToons UK and Ireland's new ""Kung Fu Panda: Legends of Awesomeness" Starts The 9th Of January On NickToons" promo (transcript below), after the sneak peek of "Kung Fu Panda: Legends of Awesomeness" that NickToons UK and Ireland, Nickelodeon UK's animation channel, gave viewers on Friday 4th November 2011, Nickelodeon UK's Nicktoons UK and Ireland channel will fully premiere Nickelodeon's latest brand new animated Nickelodeon show "Kung Fu Panda: Legends of Awesomeness" on Monday 9th January 2012 at 5.00pm (6.00pm on NickToons Replay). New to Toons, "Kung Fu Panda: Legends of Awesomeness", kicking of the 9th of January, on NickToons. A company that makes life-size cardboard cut-outs of celebrities has launched a range of masks as it looks to expand across the Atlantic. Star Cutouts, based in Ashton-under-Lyne, holds licences to make masks and life-size figures of famous people including the Manchester United squad, Dr Who characters and Elvis Presley. It decided to launch its range of £3 masks so it had products at a lower price point for cash-strapped customers. Full-size figures retail at £30. Big sellers so far have included United favourite Javier Hernandez. The company has also signed deals for ranges based on Star Wars and Disney characters, which will launch in the new year. It sells to retailers including Forbidden Planet and party stores, and achieved revenues of £500,000 in the 12 months to March 31, with £700,000 predicted for the current year. Star Cutouts now sells to distributors and retailers in France, Belgium and Germany, and plans to target Spain and Italy next, where it has high hopes for its products based on Nickelodeon children's TV characters such as SpongeBob SquarePants [and iCarly, and Dora The Explorer]. Mr Ravey said: “We also want to launch in the USA within six to 12 months and plan to open a distribution office in California. The company was founded in 2005 and has 10 staff. Nickelodeon USA Gives Nick Viewers A First Look Sneak Peek At The Brand New "Big Time Rush" Movie "Big Time Movie"
Below is a streaming video of Nickelodeon USA's brand new "First Look At Big Time Rush's New Movie "Big Time Movie"" sneak peek special which Nickelodeon USA recently aired as part of Nick USA's "The Best Week On TV" programming stunt, where Nickelodeon goes behind the scenes of the new "Big Time Rush" movie called "Big Time Movie" and features the stars and band members of Nickelodeon's "Big Time Rush" series and boyband (Kendall Schmidt (Kendall Knight), James Maslow (James Diamond), Carlos Pena (Carlos Garcia), and Logan Henderson (Logan Mitchell)) telling Nickelodeon viewers and fans of the hit Nickelodeon show "Big Time Rush" details and information about the brand new "Big Time Rush" Nickelodeon movie "Big Time Movie" which the cast of "Big Time Rush" are currently working on, including that "Big Time Movie" will be like "James Bond meets Austin Powers", that "Big Time Movie" will feature a lot of stunts and a lot of non-stop action, will feature car chases, high-flying action, "awesome" performances, and about 200 extras, and will be bringing the laughs 'Big Time', and will part spy movie, part comedy, and all about the music, and will also feature the "Big Time Rush" boys recreating the famous scene from The Beatles's "Abbey Road" album sleeve cover where the "Big Time Rush" boys cross a zebra crossing (which is also like the front cover of SpongeBob SquarePants's Sheldon Jim Plankton, Jr.'s "Krabby Road" CD music album). Big Time Rush's "Big Time Movie" will be premiering on Nickelodeon USA in 2012, only on Nick! Nickelodeon USA Gives Viewers A First Look Sneak Peek At Season 3 Of "Victorious"
Coming in 2012 with Victorious for Nickelodeon is Season 3 of Victorious which includes Tori and Jade doing a Play "Date", lots more physical comedy, Andre and Tori performing at a Chinese restaurant, An episode based on the breakfast club movie which the victorious cast gets detention, Beck and Jade might find some stuff out that causes them to have problems, Trina hitting on Beck and Tori and Jade duetting to show 2 guys not to mess with them. UPDATE - Nickelodeon UK and Ireland and Nickelodeon UK/HD will now premiere season two of Nickelodeon's hit live-action mystery series "House of Anubis" in April 2012! We will have an update SOON! 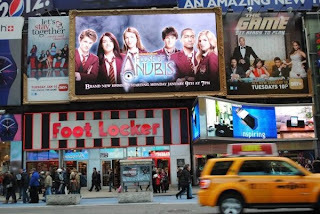 when is house of Anubis season 2 coming out in UK? @NickelodeonUK - Info coming soon! Can I compare the English version [of House Of Anubis] with the original Dutch version [Het Huis Anubis] I used to watch when I was younger? Hah aokay, for what age category are you creating those new mysteries? Same as for BTR [Big Time Rush]? You can view Nickelodeon USA's latest brand new official "House of Anubis" Season 2 trailer/promo which Nick USA is using to promote Nickelodeon USA (Nickelodeon North America) premiering season two of "House of Anubis" on Monday 9th January 2012 at 7pm ET/PT/7pm Central here on NickALive! 's Nickelodeon design blog, Nickelodeon TV Media. Mike Fukunaga (Ryan Potter): That felt good! ...there's smoking hot new episodes that are coming to a screen near you! Owen Reynolds (Carlos Knight): You want to be messing with the Supah Ninjas? Brand new Supah Ninjas, starts the 13th of January, on Nickelodeon! @NickelodeonUK - We cant WAIT! New eps this FRIDAY! In the brand new episode of the Nickelodeon action-comedy series "Supah Ninjas" titled "Dollhouse", Supah Ninja Amanda McKay is captured by a villain named "Dollhouse" (played by Tyler Poelle) who turns people into his personal dolls. While Amanda's co-Supah Ninjas, Mike Fukunaga and Reynolds Owen, are trying to rescue her, Owen gets turned into a personal doll. It is revealed that Dollhouse is the son of the maker of Speelmachers, a famous toy company, and that he captures others because it is said he had no playmates when he was a kid. Supah Ninjas "Morningstar Academy" from Jessica Wilson on Vimeo. ...the Ninjas are in for their craziest mission ever. ...as the Ninjas strike again. Don't miss a brand new episode of Supah Ninjas, Friday at 5 on Nickelodeon. In the brand new episode of the Nickelodeon action-comedy series "Supah Ninjas" titled "Eternum", a demented psychiatrist called Dr. Eternum (portrayed by American film and Television actor Todd Stashwick) lures the Supah Ninjas to an asylum to test his theory that he has the power to turn good into evil. While investigating, Supah Ninja Amanda McKay (Gracie Dzienny) meets villain Checkmate (Rick D. Wasserman) again. Supah Ninjas “Eternum” at 9:00 p.m. ET/PT from Jessica Wilson on Vimeo. Then, check out an all-new Supah Ninjas “Eternum” at 9:00 p.m. ET/PT. As part of a school project, Owen and Amanda are assigned to take care of an egg and end up taking the assignment way too seriously. Meanwhile, Dr. Eternum, a demented psychiatrist who believes he has the power to change human nature, lures the Supah Ninjas to his asylum in order to experiment on them. While in the asylum, Amanda runs into an old nemesis, Checkmate, who's eager for a rematch. It's Friday, feel like taking on a secret ninja persona? If not leave the action to the experts! Watch NEW #SupahNinjas tonight at 5pm!! In a brand new episode of Supah Ninjas, the Ninjas face off against some fierce female competition. Will Clarissa's hairpin be a match for the Ninjas? Find out in a brand new episode of Supah Ninjas, Monday at 5, on Nickelodeon! In the brand new episode of the Nickelodeon action-comedy series "Supah Ninjas" titled "Morningstar Academy", a group of highly-trained thieves, covering as prep school girls, has targeted Empire City's mint for their latest heist. The Supah Ninjas, who happen to be on a school field trip at the mint, must try to take the girls down while not exposing their ninja persona's to their classmates. "Victorious" star Daniella Monet guest stars as powerful villainess Clarissa. 9:00p.m. Supah Ninjas “Morningstar Academy” from Jessica Wilson on Vimeo. A group of highly-trained thieves, covering as prep school girls, has targeted Empire City’s mint for their latest heist. The Supah Ninjas, who happen to be on a school field trip at the mint, must try to take the girls down while not exposing their ninja personas to their classmates. Victorious star Daniella Monet guest stars as Clarissa, a cute yet powerful villainess. Only 30 minutes until... BRAND NEW Supah Ninjas!! Obviously the best way to celebrate it finally being the weekend! Just when you thought we couldn't get any bigger, we've got brand new episodes of True, all leading up to the massive season finale. Max Madigan (Greg Proops): YIPPEE! Ryan Leslie Laserbeam (Matt Shively): Watch and learn! Don't miss brand new "True Jackson, VP", starting the 4th of January, only on Nickelodeon! More of Nickelodeon UK's January 2012 schedule highlights will be posted in this NickALive! blog post when they are announced. Nickelodeon UK and Ireland will be unveiling and premiering more brand new Nickelodeon bumpers in January 2012 as part of Nickelodeon UK's latest brand refresh. According to the online television schedule guide TV Guide UK, Nickelodeon UK and Ireland and Nickelodeon HD UK will premiere the brand new two-part "True Jackson, VP" special episode called "Mystery in Peru" on Friday 6th January 2012 at 7.30pm and 8.00pm (8.30pm and 9.00pm on Nick Replay UK). According to the online television schedule guide TV Guide UK, Nickelodeon UK and Ireland and Nickelodeon HD UK will be bringing back the classic Nickelodeon show "Kenan & Kel to their schedules on Friday 6th January 2012 with two back to back episodes at 9.00pm and 9.30pm (10.00pm and 10.30pm on Nick Replay UK). New to Toons, "Kung Fu Panda: Legends of Awesomeness", kicking off the 9th of January, on NickToons. any more news of the new bumpers coming in Jan [January 2012]? look out for news eps [episodes] of True Jackson VP in the first week of jan and iCarly: istart a fanwar! Nickelodeon UK and Ireland today (Monday 2nd January 2012) completed their latest brand new channel brand refresh, which features more brand new Nickelodeon channel Idents (Station Id's), and more brand new Nickelodeon channel bumpers. 8:35pm Nick Extra Get the inside track as we go behind-the-scenes at Nick's all-action crime-fighting show, Supah Ninjas! Nickelodeon UK and Ireland and Nickelodeon HD UK will also be showing two episodes of the classic Nickelodeon show "Kenan & Kel" back-to-back from 9.00pm (repeated from 10.00pm on Nick Replay UK) on Saturday 14th January 2012 and Sunday 15th January 2012. According to the official Nickelodeon UK and Ireland website, Nick.co.uk, Nickelodeon UK and Ireland and Nickelodeon HD UK will be holding a special "SpongeBob SquarePants" weekend programming stunt over Saturday 21st January 2012 and Sunday 22nd January 2012 called "Patchy the Pirate Weekend" which will include two "SpongeBob SquarePants" marathons (one on each day) between 1.00pm and 4.00pm (repeated from 2.00pm to 5.00pm on Nick Replay UK) and will be presented by the president of the SpongeBob SquarePants Fan Club, Patchy the Pirate! You can view a high quality (HQ) high-definition (HD) streaming video that features a selection of Nickelodeon UK's bumpers for Nickelodeon UK's "SpongeBob SquarePants" programming stunt called "Patchy the Pirate's Spongebob Weekend", which features graphics designed and created by Sheffield, UK-based creative studio Pixel DNA, here on NickALive! 's Nickelodeon design blog, Nickelodeon TV Media. The two-part episode of "True Jackson, VP" titled "Mystery in Peru" is the series finale (final episode) of "True Jackson, VP", and features True and the rest of the Mad Style staff going to Peru to attend Amanda and Brock's wedding where they discover there's a grand prize for whoever can capture a jewel thief. When Mr. Madigan also announces that he decides to retire, it's not the end of Mad Style - in fact, for someone, it's only just the beginning! NEW True Jackson, VP hour-long movie “Mystery in Peru.” from Jessica Wilson on Vimeo. Those wedding bells keep ringing at 8:30 p.m. ET/PT in the new True Jackson, VP hour-long movie “Mystery in Peru.” Amanda is getting married to Peru's greatest shortstop Brock Champion and the gang travels to Lima for the big day! Prior to them leaving, True and her friends discover there is a $20,000 reward for a jewel stolen from the Museum of Peru. If True can find the jewel she'll be able to start her own clothing line, but when Jimmy and Ryan catch wind of the reward money, they want in too. A “boys vs. girls” competition for the missing jewel ensues, but trouble finds them as 12-year-old “Mr. Big,” the mastermind behind the jewelry heist, locks them up in a metal cage dangling over a volcano. They must find a way to escape to make it to Amanda's wedding in time! According to the online television schedule guide TV Guide UK, Nickelodeon UK and Ireland and Nickelodeon HD UK will be bringing back the classic Nickelodeon sitcom "Kenan & Kel", which stars the classic Nickelodeon stars Kenan Thompson as Kenan Rockmore and Kel Mitchell as Kel Kimble, and features the famous "Aw, Here It Goes" "Kenan and Kel" theme tune performed by Coolio, to their schedules on Friday 6th January 2012 with two back to back episodes at 9.00pm and 9.30pm (10.00pm and 10.30pm on Nick Replay UK). @NickelodeonUK - Yup 9-10pm every night til Sun [Sunday 8th January 2012]!! @NickelodeonUK - We do! Kenan & Kel is on Fri,Sat & Sun 9pm! but in the daytime like it used to be - Sister Sister and all the rest! Aw here it goes - Kenan & Kel from amovi on Vimeo. NickALive! and Nickelodeon TV Media would like to wish everyone a very orange Merry Christmas and Happy Holidays! To celebrate, below are a selection of great festive Nickelodeon Christmas videos. Don't forget, it's not too late to download some great festive Nickelodeon Christmas downloads! Enjoy!